forget art is a series of projects distinguished by their intangibility, influenced by Minimal and Conceptual practices. 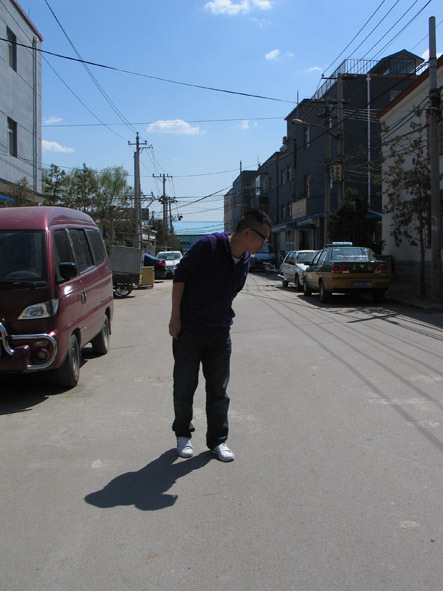 Although the group is fluid, Ma Yongfeng is perhaps the most visible organizer and I sat down with him recently to discuss what it meant to “forget art” and how their forthcoming show in a public bathroom in Caochangdi would manifest itself given their concern to leave no trace. Edward Sanderson: Can you start by explaining what forget art is and what your role in it is? MYF: Actually, I think I’ll begin with the term “alternative”, I think this term has a long history. Some people use “independent”, some use “alternative”, but whatever they use it is because they think the museum space and gallery space cannot satisfy a demand for interesting projects. So I started with this idea for the project, because I think it is time to choose another way. I got my original inspiration from the Arte Povera movement in Italy, Fluxus in Germany, and the American Minimal Art movement, all of which happened around the 1970s, as well as some artists from the Gutai Group in Japan. These are some very interesting works, some very interesting artists, they were very influential with me. MYF: Yes, Mono-ha, but before Mono-Ha there is the Gutai Group after the 50’s. They were doing what they called “mobile art”. Looking at recent events, I’ve I found a very interesting thing. Since the mid-90s contemporary art in the West has been booming in America and Europe, and I think this is connected with the rise of the Biennales. So since the 90s there has been a tendency for people to make these big works and big installations, and film and video projections. So everything becomes luxurious, and huge, and spectacular – people want to make wonderful and fantastic visual effects. But I think my starting points and influences are very interesting in this context, because Arte Povera comes out of the restrictions after World War Two. My approach also gets inspiration from Jerzy Grotowski’s “Poor Theatre” – it’s like people thought: “Oh, [art] has too many symbols, there’s too much decoration in theatre and art, so we need to delete something. We need to be poor, to use simple materials like stone, trees or iron, the basics, materials from everyday life to make interesting statements. Maybe the Millennium served for people to rethink their approach. I found many young artists in Beijing, Berlin and New York starting to make smaller works. These small works are not very high profile but part of their life and their soul, and not just to make objects but to make small, simple things, from your heart. So last year we introduced and shared ideas about Arte Povera, Fluxus and Conceptual Art, Minimal Art from the 70s, with some friends. I think they are still provocative, still very strong ideas. ES: Do you think it has a particularly strong effect in China? MYF: Yes, they understand it totally. Because the young artists can accept anything and have no memory of revolution, they have no memory of the Cultural Revolution. Even I am not interested in any kind of work about revolution. I just care about my life because I was born after the 70s. ES: You think you’re typical? MYF: Yes. But I think it’s not just about bringing the ideas over or copying them, it’s the mixture. You see these kind of works, you get inspiration from them, and you have your life experience and art practice – because you come from China maybe you have some additional input from local philosophy, for instance Mono-ha was a mixture of Minimal Art and Zen philosophy. So we have this kind of tradition, from Laozi and Zhuangzi, the most important thing is not just to read their books but to mix their ideas with some interesting forms, that’s what artists should do. That’s the artists’ work. ES: Talking generally, not just about forget art, but about Beijing and alternative practices. Is there a lot going on at the moment? Do you think Beijing is particularly active right now? MYF: I think Beijing and Shanghai are still the most important places for the contemporary art scene in China. You know, in China we have a long history of philosophy. It’s a kind of utilitarian methodology, very realistic. Confucianism told you to have respect for your parents, and to study very hard to get an official post (or maybe you can use bribery or something!). It’s very realistic, I would say. I think that 90% of people are very realistic in this way and over the 2000 years since the Spring and Autumn periods, we also have had a lot of philosophers, this has been a real cultural blooming for China, much like in the West with the Roman period, Plato, etc. But after the 2000 years up to the Qing Dynasty, since then there has been a totalitarian way of thinking. So people here now have a kind of ideology that they all use the same kind of things to think about the world. We call it a “herd mentality”, we think like we are in the herd, we think we are all in one boat, we share the same ideas, and we can’t have independence and personal experience. You have to belong to the collective; you have got this collective memory, much like during the Cultural Revolution. But now people have more and more freedom, and the young people—especially the young artists who were born in the 1980’s—are more free in their thinking, and have more personal experience in their works. I think it’s a good start. And also another point, from 2006 until now there has been a lot of “blind speculation” amongst the art people here. They think: “Oh, it’s a good time for art and we have to push things to the peak, so we can get more money”. There are no real non-profit groups or organisations here, not really. In Beijing, there was Universal Studios [now Boers-Li Gallery], and Platform China, Long March Space. 5 years ago they would call themselves non-profit organisations – they were doing some alternative projects as a result. But after two or three years they became more and more commercial. And that’s the situation, that’s the phenomenon, a very common phenomenon [in China], because there are no systems of foundations or rich people creating contemporary art funds to support this kind of art scene. So most of the galleries, the non-profit organisations, can’t afford to carry on, and have to sell some works. Say they want to do video or new media shows, but they have to support themselves by selling artworks. And there are also some other things going on, like curators and writers setting up alternative spaces in China. Like the Arrow Factory – they use a street shop as a small space to do shows. I think it is very connected with local community – they need their context, and this is their concept. But I think it’s not really what the young artists want. I think we need things that are even more free. We don’t want any limits, sometimes we don’t even need a space. If you have got a space you have some limitations, and we don’t want that. You do get some interesting projects [in gallery spaces] but it’s still a very traditional way of working. I think that in the art world, people have to think about this, how to get rid of this burden. We think that normal life is art, but we try not to use that phrase, it’s a very old phrase – like the statement “trying to blur the boundary between art and life”. It’s such an old-fashioned sentiment. We just want life submerged into life, concept submerged into the concept. Things in things. ES: So they have a closer connection, or no division at all, you just try to bring them all together? MYF: Yes. To give you an example, I think spitting here in China is very normal, so I spat in the street, but I have to wait for it to dry out – that’s a kind of responsibility I have taken. I have to wait for thirty-five minutes or so for when it becomes dry and then I leave. So I think people will ask “What’s the line between art and work?” We don’t call it “artwork”, we call it life itself. But we have to include that wait! Someone asked, why don’t you just piss in the street? [laughs] And wait for that to dry! But that’s too big for me! Because with forget art we try to do something like life itself – like normal things. People see what you are doing and they think, “oh, nothing happening!” Maybe the spitting is over in one second, but you have to spend 35 minutes waiting: one second and 35 minutes. You have to devote yourself, be responsible for this. Then people don’t say it’s a strange thing – because you are an artist it is expected that you do strange, weird, bizarre things, different from life – but we just want to be normal. We don’t transcend the forms of life, we use them as material, that’s all. I know there are currently some artists in groups, like Company and some other new groups. They are totally different from the groups in the 80s like the New Measurement Group. The New Measurement Group is more like a group, they are doing something together. But now some artists initiate groups and they are very loosely connected. I mean sometimes they are doing something together, but sometimes they are doing very different work. ES: So there’s not a very distinct group or style? MYF: Yes, there’s no “brand” like that. They can do group projects, but when one artist is doing a project individually they are working very differently, they have their own experience. So I think they are more open than the earlier groups. Sometimes they are doing projects but sometimes they are doing their works. That’s quite interesting. ES: What age group are they? Are they 90s generation? Are they very young? MYF: 80s, most of them are born in the 80s. Like forget art, we are not really a “group”, this is our “orbit”. Maybe some artists enter into our orbit, to a point where we will do something together. Although it’s not a group or an organisation, sometimes I’m in charge of organisation – I’m the service man to do things! Because you have to have some people to manage, you can’t forget anything! That’s the issue, if you remember – do something about forget art! [laughs] And if you forget it, ok forget it! So that’s quite interesting. Because we’re not curators, or writers, or some art-world related people making an organisation. We are not doing something like Open House who rented a place and brought in video or set up an installation. I think this is still too much. Of course artists have different ideas but if I used that space then maybe there will be several artists doing something invisible and then we leave. So we want another option, not like a show or an alternative exhibition. I think in a gallery or a museum space you can do a show, that’s ok, everybody likes that. You add it to your CV, that’s good. But if we use another space, it’ll be in a “disastrous” way. But the disaster is not a criticism, we are very low profile, it’s another way of disaster, not a very visible disaster – not like an earthquake, but something from your heart. Say if you’ve separated from your girlfriend, maybe you will be heartbroken. Maybe you can’t see it, but it’s heartbroken. We don’t need a volcanic eruption, we need these heartbroken things, on the inside [laughs]. That’s the different way in which we think about the term “alternative”. ES: Do you see yourself as an organiser? A curator? How do you see yourself within forget art? MYF: I’m basically an artist; I don’t see myself as a curator. Sometimes artists have a great concept about what they want to do, and the curator or the critic follows on from that. Or sometimes the curator is ahead of the artist. But most of the time they are about the theory and not about practice. But it is possible for artists to make works that combine the two. ES: How has forget art developed? Is it the same group of artists that you were talking to last year when you first mentioned the idea to me? MYF: We are very open. I’m not going to use the word “organisation” because it’s not an organisation, so I call it an independent “orbit”. We have our independent activities. We are all different. Some people want to make artworks, some are maybe saying they don’t want to make artworks. I think we’re doing something different, but because the word “different” is so overused it’s difficult to use it. ES: Much like the word “alternative”? MYF: Well we do use that word, but actually we’re not an alternative organisation because there are no real group members. Every time, we cooperate with different artists, we have no space to show in, we are doing things in any kind of space or location. I mean, sometimes we do things in the street – street intervention work, sometimes we are working in special spaces, like the public bathrooms we are using for the next show, maybe after that we do something in a museum space? If people ask, “how can you use a museum space?” we don’t say something like “oh, we’ll try to redefine the attributes of the original space” – we will actually try to keep these. For example, MOMA is a museum space. They show Andy Warhol there – for instance famous works like the Brillo Boxes. 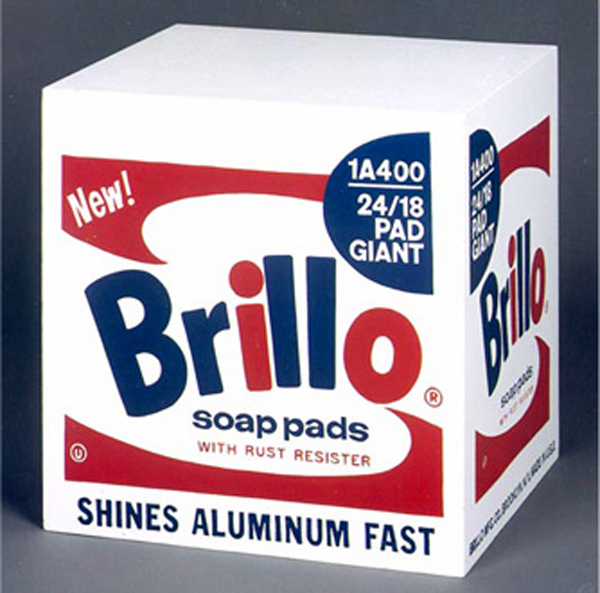 Maybe we’d doing something to “reverse” the Brillo Box, about the Brillo Box form but paint it white, so it looks like a very Minimal box. I’ll bring that box and put it in the MOMA space (but of course security will stop me). So we’re trying to use this action as a conversation, a dialogue, with Andy Warhol. But we’re not trying to resist Pop Art or consumerism, we’re not interested in anything about demonstration or resistance. We’re just like a filter, or transformer. We accept anything – Pop Art goes through our filter, and becomes Minimalism! ES: You talk about “Urban Nomadic Tactics” on the forget art website, an idea of movement in your activity, which seems to be similar to a “guerrilla” attitude as you alluded to when you talked about the Brillo Boxes. MYF: Yes, we’re not so much about setting up in one place. In society, there is a long history of nomadism and there are a lot of people living this kind of nomadic life in China, moving from one city to another. So people have this form of life. That’s also why we don’t need any space – because we “forget art”, why do we need any space to do this? You don’t need that, you can “forget art” in any kind of location! We are free. We are in a situation, or a time after time, and a space after space. We have time to do this. We don’t need space to show works, we don’t rely on the traditional institutional space – we should get rid of this kind of thing. And these are not “events”. We use terms like “situation”. An “object” is just this thing [indicates a cup], but if we draw a circle around it, it’s an expanded object, developed, and it becomes a situation. But we don’t want it to become bigger and bigger, we’re just in the middle, in-between. We want this kind of in-between situation – like the act of talking with people. ES: Right, there’s a piece where you are talking to someone, and then coming back again a year later to the same place. MYF: Yes. Because that’s about my experience, but it’s also everybody’s experience. People have this kind of experience, but they forget it, so last year I made a piece about this kind of situation. It’s not a performance – it’s not meant to be very intentional, or pretentious, it’s just a talk in the street with a stranger. Because I know nothing about him I talk about something I’ve broken – where can I repair it? The conversation is about three minutes long, and I recorded it (although he doesn’t know that). After one year, I call and ask him: “Do you remember we had a conversation on this day last year?” He can’t remember, of course. I say, “OK, come here again and I will get you dinner.” So he is interested in the dinner and will come. I give him the words on a piece of paper and tell him we have to remember the event, we have to do something like a rehearsal (an idea from Poor Theatre), and then we do it very seriously! We speak it again at the same time, the same moment, in the same location. I think it is interesting because nobody cares about it, they think, “oh, it’s just two people talking in the street, it’s a very normal thing”, but I think the most important thing is that time has changed something. ES: On the website you talk about “sometimes you switch between art and non-art”? How do you see that working? MYF: You know, we don’t want to stay in art, it’s a bit boring to do that. Those artists that want to make “good” works and attend the big Biennales, or some show in UCCA – that’s quite wearying! The people who set up the exhibitions like that are people who make big things, these big nothings. Now there are the Yes Men and Wild Boys doing some crazy things, and the young artists in China like them very much. ES: Do you think Chinese artists, Asian artists, are particularly interested in these sorts of things now? MYF: Yes, some artists like the Shuang Fei group from Hangzhou, they are doing something like this. But forget art is not trying to do that. We want an aesthetic of the low profile, or the aesthetic of the “ignore us”. With forget art we are still in the context of art, but we need that contradiction, that confrontation – confrontation with the art world and the artworks. For example, once I brought a battery charger into a museum space. I found the walls there all hung with big paintings and I thought maybe I can do something with this situation? 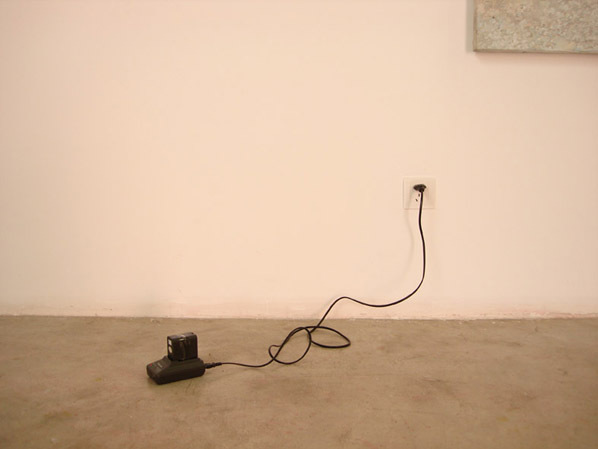 So I brought my video camera charger and put it amongst the art – and people didn’t notice it. After one week, people come back and the charger is still there – they don’t care about that, maybe they think it’s some staff working in that area. I think it’s kind of an ignorance—or it’s nothing—but I do think it’s connected to that space, although you can’t see it, there’s some energy in there, some transmission inside. Maybe it will consume several volts of electricity, but people won’t notice that. I don’t think I had seen Ceal Floyer’s work before I made this work, but when I saw her till receipt, I thought it was so subtle and minimal and has this reference to Robert Ryman – I thought it was beautiful, very beautiful. But people who see the receipt at first can’t understand it fully, but it develops. ES: I know you also like Martin Creed. For instance his lights turned on and off, those kind of pieces that he does – really, really subtle, to the point of disappearing. MYF: Yes, I like him very much. But you know, although it’s a Western artist’s work, from England, I think it’s referring to Eastern thought and philosophy, especially the Jingangjing (The Diamond Sutra) – a very famous Buddhist text. In this text the Buddha (the Buddhist sutra) talks about the Void and Emptiness, how you can feel the Void and Emptiness in everyday life. If you see this Void you won’t see anything, but just the name of this thing that you see. When you first read this book you may be confused – if you see it, actually you will not see it, it’s just the name that you see. There are a lot of conversations like that in the text. So – well it makes me very confused! This way to see the world, I think is an alternative way. Three thousand years ago there is this wisdom about the world, but people still don’t understand it today. So that’s an idea behind forget art, that all the artists will make something to deal with this kind of concept. In 2008 I was staying in Vermont on a residency with several other artists. The organisers wanted us to do some work for an open studio. Because the place where we stayed was very high in the mountains, there was a lot of snow. So I didn’t want to do any works I just want to play! But they say “Tomorrow we are going to have an open studio. What kind of thing are you doing?” I haven’t got any idea! But that pushed me to think about what I do. I want to play with snow, so why don’t I make some snow toilet paper? So I use a can and push some snow inside and make it very solid. After one night, the snow shrinks slightly and can drop out of the can and then I cut a hole through it. So it’s like a toilet paper roll, almost the same size. I put it on the table and when people come to see me, they ask “Well, where are your things?” “That’s it!” I say to them, “you can use it!” and they laugh! So I think that was clever and humorous – people liked it and that’s good, some kids liked it and that’s also good. I think with good works kids and old people like it. ES: And then this piece melts away eventually? MYF: Yes, after four hours it melts, and becomes nothing, it becomes emptiness. So it’s a contrast between the inside and the outside. The snow and the form, and after several hours it will disappear. My point is I have to do something with nothing. I don’t want people to buy my things, because many things you can’t buy in life. Like love! I mean love needs time – to know a girl and have that feeling, maybe over one year, maybe two years. And you can’t buy that. Actually Capitalism tries to make everything become a commodity, that’s not acceptable to me, it’s unfair to the work. That’s also an idea behind forget art. ES: How do you see forget art developing? Will you carry on doing situations? Will you do more shows, like the one coming up? Or is it a thing which is very open? MYF: Yes, it’s very open. We cooperate with different artists. Every time maybe we put a lot of energy into the intangible works, like the situations. The situation is intangible, like those of the artist Tino Sehgal, it’s just a situation. We can’t call it a performance, because a performance is a traditional work. ”Live work” is ok, but situation is better. It’s like a film still from a film, from cinema, of people talking or people doing something, or falling in love, or people doing an exhibition – this is all material for us. Because we try to “forget” art we use every detail of this institution – like curatorial practice, the art fair, art gallery, arts management. We can use everything as material to do something related to art, or unrelated to art. As an example, one of my friends is trying to see some show, a big show in a museum – he calls this the work. Every afternoon he goes there to see a big painting for two hours, and he says, “I’m doing the work to see the work”. That’s ok, I think it’s no problem. He did another work where he pays for three months of traditional Chinese music lessons, on the erhu. And then he performs in the gallery space for the visitors. That’s involving several layers of social experience. Yes, I think with these situation-based works, and you have to use a lot of time to do them. ES: You now have a situation, a show coming up. Why have you now chosen to somehow formalise forget art, to have a proper show? MYF: I think if you want to do something new, it’s difficult, probably people have done that. But I think if we just make a new start it’s ok. A new start means we choose a place, in this case it’s a public bathroom in the village, not very clean or tidy, just a specific environment that’s perhaps not very popular, and we just use it for one day. We don’t try and change anything about this environment. We have six or seven different spaces, female rooms, male rooms. I told all the artists: don’t try to change anything about the space, just the details or some part of it, and do some small interventions. When the audience come into this place maybe they can’t see any works, we just want the public bathroom to still be the bathroom, we don’t want to change a lot. We think if you want to do that, use a gallery space, use a museum, you can do fantastic things! You can use projections, you can do big installations. But here, we don’t want to change anything. We just use very small ideas to change something inside and people may not notice at all! That’s our motivation. ES: So the changes may look completely normal? But there’s still changes taking place? MYF: Right now, I can’t say that 100% of the things are like that, but I think if we have 70% or 80% it will be ok, because everything is not so progressed yet. You also have to compromise with the artists. With some artists you have to have a long talk with them, to help them get the theme. ES: So, who are these artists? MYF: Most of them are young artists, born after the 80’s, very young, very active and very dynamic – they have many good ideas. They want to try the new things and new forms, new ideas. Sometimes they really surprise you. So I like to cooperate with them. ES: And when is the show? Ma Yongfeng was interviewed by Edward Sanderson (CPU:PRO) at the The Cave Café, 798 Art District, Beijing, on 29 July 2010. Interview edited by Edward Sanderson. From Chapter 42, Tao Te Ching of Lao Zi.